MATCH REPORT: Storm Beat Lightning in Patton Conference Game! 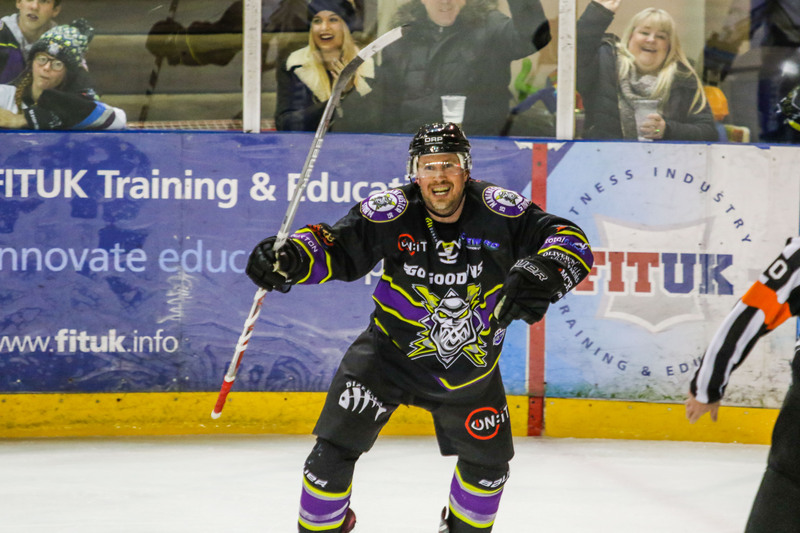 Tickets for Storm’s upcoming game against Guildford Flames can be ordered online HERE, or by calling the box office on 0161 926 8782, or in person at the box office. 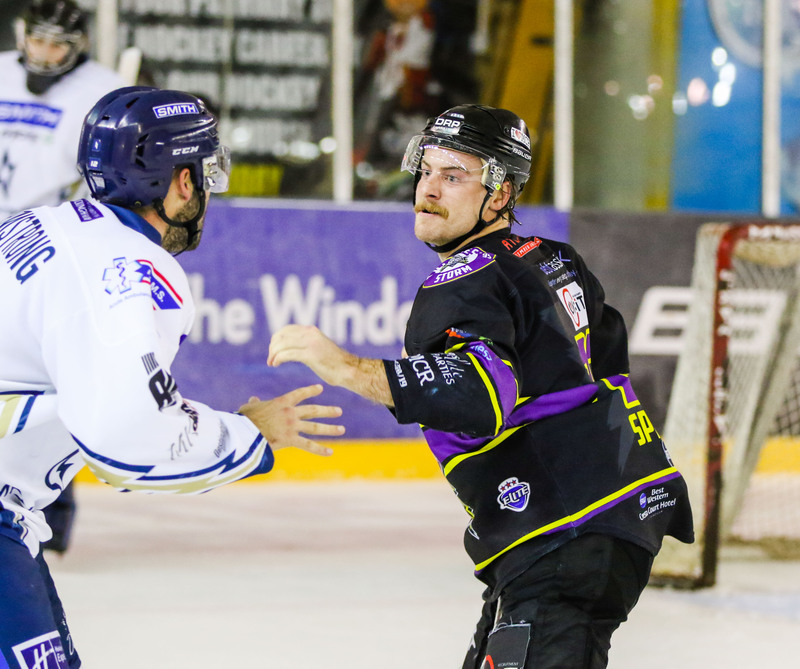 Just under three minutes into the first period there was a clash of fists, as Bakker and Griffin dropped the gloves, Bakker taking two minutes for cross checking and a five for fighting – Griffin taking five for fighting and a two plus ten or instigating. Storm were first to get a goal, as Richardson slotted the puck home with assists from Long and Brooks, at 9:35. With those penalties being the only ones taken, the remainder of the first period was relatively clean -with some end to end hockey, some slick puck skills, and both netminders not letting anything past. As the Buzzer signalled the end of the period, it seemed things would likley pick up upon return. Storm’s second goal came in not long after the second period face-off, as Ehrhardt sent a long range wrist shot, assisted by Brooks and Richardson at 20:31. Not long into the second, a penalty was handed to Moffatt for interference at 22:23. Lightning’s powerplay opportunity was dampened pretty quickly, as Meidl then sat for high sticking at 22:50. During four on four hockey, Lightning claimed their first of the evening, scored by Baillargeon, assisted by Fine and Mazanec at 23:22. Long made some skilled plays on a turnover in the offensive zone but no one was there for drop pass. Overall, it was a much faster period, with plenty of Storm chances and Killeen keeping Lightning in the game, with some amazing saves. Storm then scored their third of the evening, as Ruopp got his first goal of the season straight off the face-off and along the boards, assisted by Brooks and Richardson, at 35:03. Less than a minute later Storm went on the penalty kill – and a strong one, as Bakker was sent to the box for cross-checking at 35:46. As the buzzer rang out at the end of the second, gloves were dropped between Springer and Armstrong and a fight broke loose. It was Storm who served the longer penalty, with Springer being handed five minutes for fighting, and two plus game for instigating; Armstrong only being given five. Goal number two for Lightning was a powerplay goal, scored less than a minute into the third period by Neiley, over the shoulder of Ginn – assisted by Fine and Anderson at 40:46. At 47:05, Storm managed to get a goal back and took a two goal lead, scored by Long with the assists from Brooks and Richardson. It was one penalty kill after another for both teams as Lightning’s, Shudra sat in the box for slashing at 47:05, with Byers taking two minutes for tripping just as Lightning went full strength. The third period was fast but scrappy around the nets at times, tensions rising as Lightning attempted to pull a goal back. There was a penalty to Griffin for delay of the game at 52:48, Storm not managing to get through Killeen on the powerplay. It was Lightning who scored next, with a backdoor goal by Baillargeon, assisted by Griffiths and Golovkovs at 55:19. 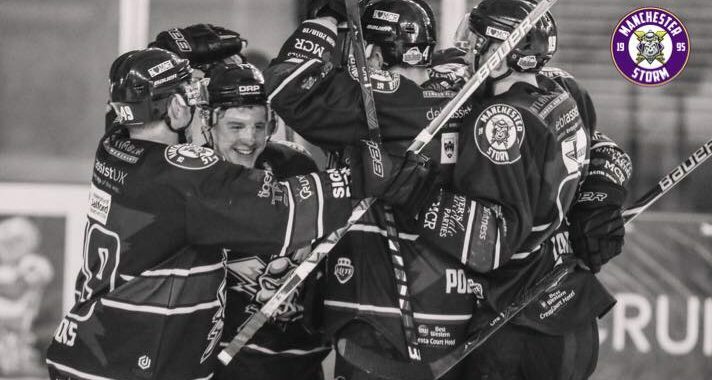 Killeen was pulled in favour for an extra player in the final minute of play following a timeout, but no team were able to send the puck home. Storm took the two points in regular time, claiming the victory at 4-3. Man of the Match for MK Lightning went to, #29 Michael Fine. Man of the Match for Storm went to #49 Brendan Brooks. Referees: Tom Pering, Andrew Miller. Storm’s next home game is next Saturday against Conference rivals, Guildford Flames – 19:00 face-off, Planet Ice Altrincham. The OSC have a Storm Smartphone Quiz event at Cresta Court Hotel, TOMORROW, 4pm-7:15pm email [email protected] to book! 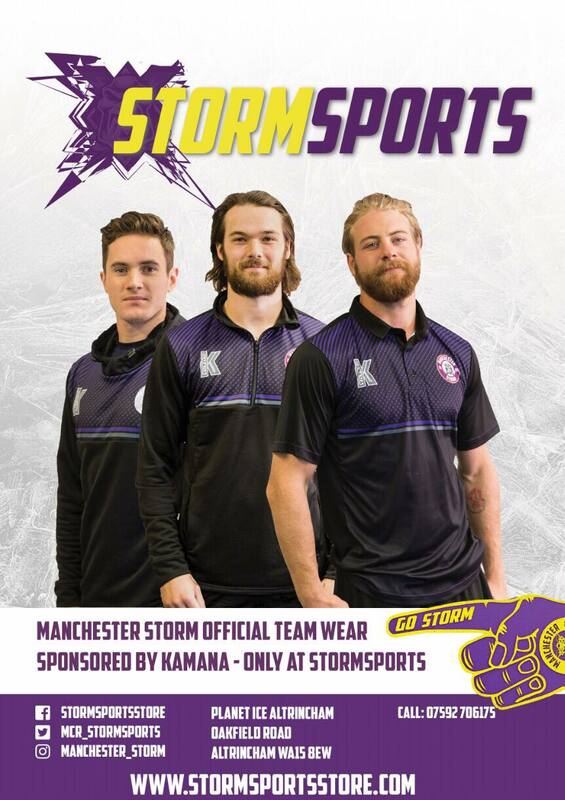 Storm Jerseys: Last Chance to Order for Christmas! Manchester Storm’s Adam Barnes Makes Team GB u20s List!